KISS FM is proud to support the needs of local pets – especially those seeking a new home. That’s why 98.9 Kiss FM have teamed up with Central Oklahoma Humane Society and Hudiburg Subaru Luv2Live Campaign to bring you closer to your new best friend. Each week KISS FM will feature different adoptable pets available through Central Oklahoma Humane Society and we strongly encourage all potential pet owners to participate. Last week’s pets were Gomez and Jelly Bean. They’re both still available for adoption and looking for those special families! This week’s pets are Baxter and Piper! 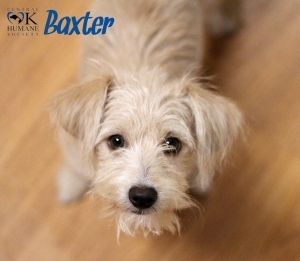 Baxter is a 4-month-old blonde and white Terrier mix. This super playful little guy has tons of energy and loves to talk! He’s also very friendly and enjoys playing with everyone and everything. He adores people and just wants you to be happy! He’d absolutely love to be your new best friend! Piper is a 5-year-old white and brown Domestic Medium Hair mix. This gorgeous gal has pale green eyes that are so intriguing! She’s very friendly, laid back and enjoys lots of cat naps! She definitely isn’t shy and likes to be the center of attention. Meet her today at our adoption center!